This one is no different. Perhaps it will interest you, or perhaps because I made it and experienced it, the story is only important for me. Either way, I’d like to share it. Sometimes creative ideas come all in one, but sometimes several unrelated things all converge at the same time, and at the intersection, inspiration is born. This quilt, named “Established”, is a result of such an intersection, and it builds on the story I shared here of making my Wishing Well quilt. As you can see, this is a large, single block quilt. 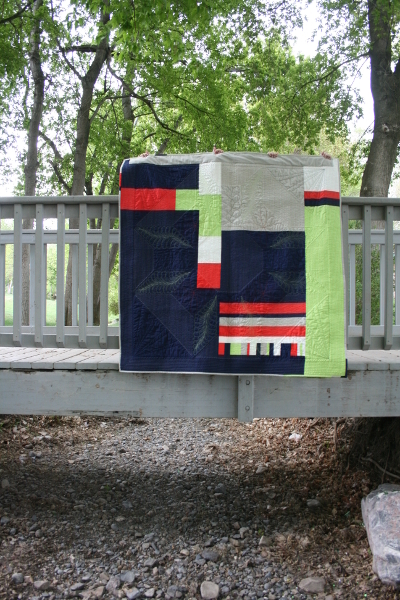 I have always been drawn to barn quilts. I love the way they look, and wondered, if I were to have one of my own, which block I would choose. A barn quilt, the prosperity block, 2 Chronicles 20:20, were sort of swimming around in my mind. Then I read about a contest being held, and to enter you simply had to make a quilt out of American Made Brand solids. 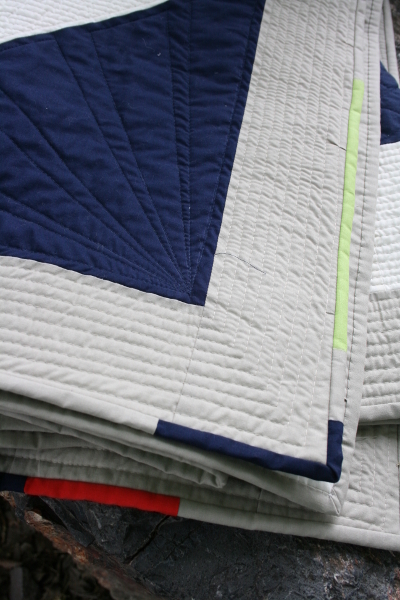 I had never made a quilt entirely of solids, so I decided to try it and see what would happen. The funny thing is, I don’t think I’ve ever been interrupted so much while trying to get something done! It was a crazy time of year, and school was starting, and it was that insane year (August 2014) that ALL EIGHT of my children were going to be in school, from kindergarten to 12th grade. I would race to my machine to sew, and within minutes someone needed something. Each time I took a deep breath, reminded myself that quilts can wait and mothering is my #1 priority, and went to meet the need. The deadline loomed and I thought I’d never make it. The deadline was extended and I hoped. I was interrupted. Again and again. At last the deadline came and passed and I had only begun to piece my backing. Oh well. The kids got settled in school. I kept working on it. I decided to learn some new things, like carefully marking my straight line quilting, and learning how to free motion quilt some feathers. I made mistakes and told myself it wouldn’t have shown well, anyway. But I also loved it because it was so strong and bold. And that beautiful verse of scripture was now so deeply rooted in my associations with this quilt block that I thought of it every time I worked on it. Finally it was finished, and it represented many firsts for me. The backing was my first try at improv piecing, a result of using every last scrap to make it fit. 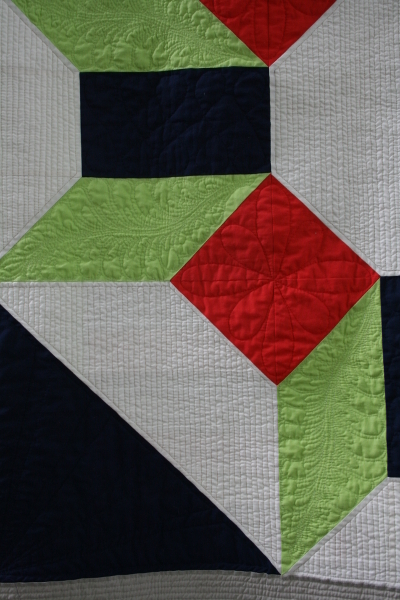 The quilting was a first. All solids were a first. Lots of things happened here that I’d never done before. I wondered if I would be disappointed that I hadn’t reached my goal, but to my surprise, I wasn’t at all. When I looked at it, it made me happy because it reminded me that I’d kept things in the proper perspective and stayed rooted in my values and in commitments I’d made about being a mother. I wanted it to have its own name, but also wanted it to be closely related to my Prosper (wishing well) quilt. So I called it, “Established.” And I love it. It’s the first quilt (other than a few minis) that I’ve hung in our home for display. Also, I think this is my favorite picture I’ve ever taken of a quilt. I feel like the spot and the quilt were made for each other. I almost wished I could just leave it there, or paint one there, or take this place home with me so I could hang it there always. It makes me so happy. 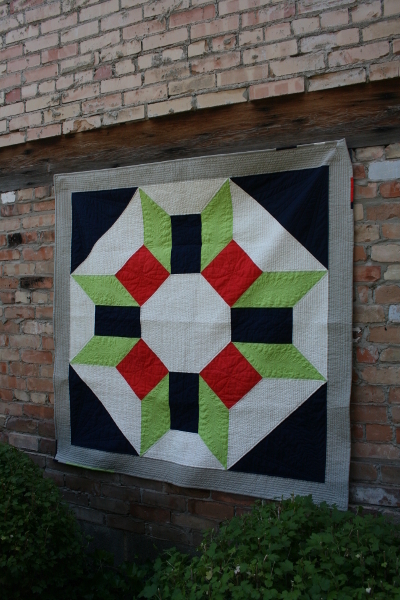 I happened on your blog because of a mention on another blog of your “Scrappy Swoon QAL” from a few years back. 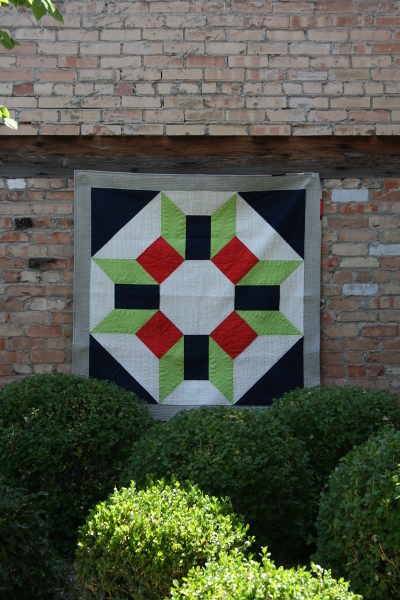 I stayed to take a look around and when I saw the picture of this quilt on your “Finished Quilts” page, my first thought was (no lie) “that would make a great barn quilt.” So it’s no surprise that when I got to this post, that’s exactly what was part of the inspiration for it! Love what you did and the gorgeous quilting on it. 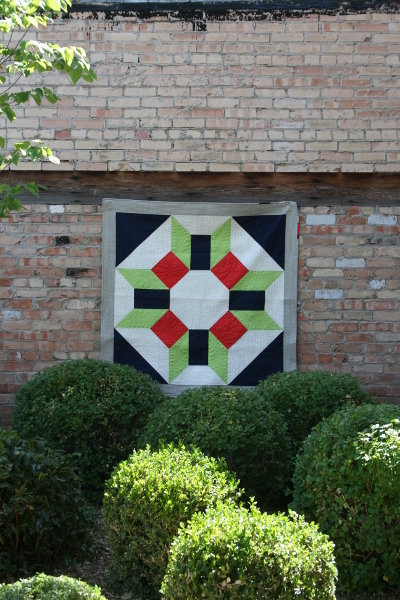 I think it’s great that you got to hang it outside (see, it DID get to be a barn quilt!). I’d also encourage you to paint one (either this design or another) for seasonal or permanent display but know that I’m biased having done my first two this past year. Always love a good story about a “project’s journey”!